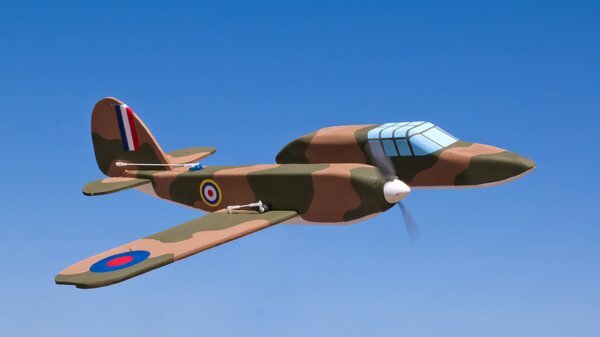 By Terry Dunn on June 6, 2018 at 9:08 a.m.
One of the most enjoyable aspects of aeromodeling is exploring how far I can twist the common perceptions of aircraft design. One of the most enjoyable aspects of aeromodeling is exploring how far I can twist the common perceptions of aircraft design. Whether through radical asymmetry, cartoonish caricatures, or outlandish adaptations, my experiments often reveal that the limits of "airworthy" stretch far beyond what we are used to. My tests usually only serve to satisfy my own curiosity. Yet, unusual design traits can sometimes provide unique benefits. For instance, I've heard that builders of pylon racers will occasionally configure their models with only a single aileron for roll control. It may sound trivial, but that is a radical departure from the norm. 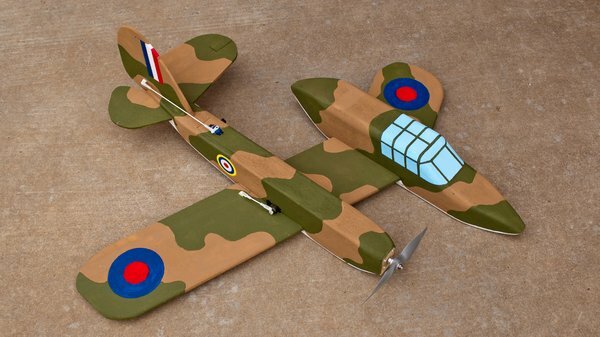 The vast majority of RC models have two ailerons - one on each wing, moving in opposite directions. While I do not often fly pylon racers, the potential weight, simplicity, and cost benefits of a single aileron set-up in a sport plane intrigued me. I decided to build an airplane with just one aileron to see how it would perform. Coincidentally, my model would have the aileron in the racer-preferred starboard wing. However, I would be asking my model to turn both left and right! The model that I chose to build is the Parallax, an asymmetric park flyer I designed a few years ago. I already had a partially-completed example on my workbench. Most of the airframe was built, but the ailerons were not yet configured. So I knew that it would be a perfect candidate for my one-aileron experiment. The unusual, asymmetric layout of the Parallax makes it ideally suited for experimenting with single-aileron flight controls. 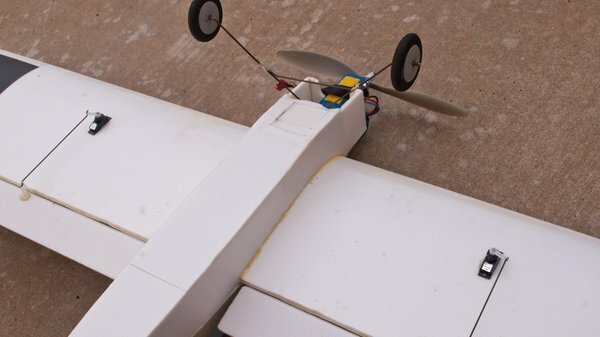 As expected, omitting the port aileron provided the obvious benefits of not having to purchase or install a second aileron servo, the necessary extension wire, or the relevant control linkages. Granted, the cost savings is not huge. Yet, when viewed as a percentage of my overall investment in the model, it's significant. The same can be said of the weight savings. This was my seventh Parallax build, and the lightest by more than an ounce…thanks in part to the omitted aileron. When discussing the center of gravity (CG) for airplanes, we tend to focus solely on the fore-aft balance point. Yet, on an asymmetric model such as the Parallax, lateral balance is also an important consideration. The model is not any more sensitive than "normal" airplanes to lateral imbalance, but the unusual distribution of components means that good lateral balance can never be assumed. So I was attuned to the potential lateral balance effects of the absent aileron servo and kept everything in check. This single servo and aileron control surface in the starboard wing deliver all of the roll control for the Parallax. Omitting the port aileron provided moderate cost and weight savings. Regardless of the benefits I could reap from a single-aileron model, the point is moot if the airplane doesn't fly well. I was happy to see that the simplified Parallax flies just fine. One difference I noticed is that the roll rate is noticeably slower than my other Parallax models. Additionally, rolls follow a spiral-like path, rather than being axial. The airplane is easy to fly, however, and it responds to my commands in the usual way. Continued flight testing has revealed additional differences in flight characteristics from my other Parallax models. This one displays pitch coupling in knife edge flight. It also seems to stall at a higher speed than my previous models in spite of its lighter weight. Since I had implemented other deviations in this example (most notably using a flat-plate wing as opposed to a traditional airfoil), I could not logically attribute any of this behavior to the single aileron. In fact, I suspect that the higher stall speed is tied directly to my airfoil selection. 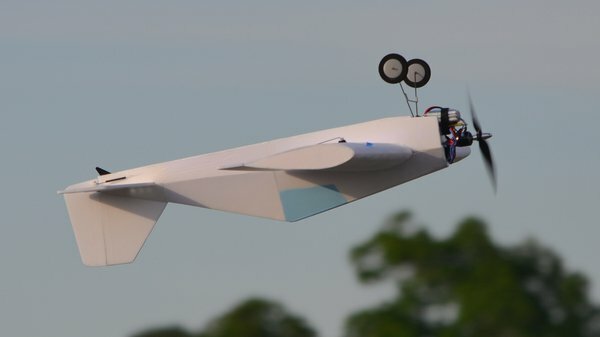 In order to determine the precise effects created by using a single aileron, I decided to establish a test where using one or two ailerons was the only variable. For that, I enlisted another of my favorite models. The Parallax flies well with a single aileron. The most notable performance difference is that rolls follow more of a corkscrew path. Dan Santich's Hots and all of its derivatives have been popular sport and fun-fly models for decades. My version was built using plans for the original Hots. However, I substituted Depron foam for all of the balsa and plywood. I also powered it with a small brushless motor and LiPo battery. The resulting plane looks a lot like a standard Hots. But at only 21.4 ounces ready-to-fly, it is about half the weight. The result is a well-mannered and very aerobatic park flyer. My Hots is configured with a separate aileron servo in each wing. Using my Spektrum DX8 transmitter, I changed the model's profile settings from "two-servo wing" to "one servo wing". I then programmed a simple 100% mix with the aileron channel (connected to the right aileron servo) as the master and the Aux 1 channel (connected to the left aileron channel) as the slave. I programmed the mix to be enabled with a switch. I also made sure to disable any direct control of the Aux 1 channel. This ensures that I won't accidentally bump a switch that would move the left aileron in flight. Using this configuration, I take off with the mix enabled and have both ailerons working normally. At any point during the flight, I can flip the switch to disable the mix and fly using only the right aileron (the left aileron stays in the neutral position). This allows me to determine the exact performance differences and ancillary effects when using a single aileron. The Hots is equipped with two aileron servos. A switch on the transmitter allows me to disable one aileron during flight. From my vantage point on the ground, the only difference I can tell when using one aileron versus two is the roll rate, which slows significantly. Logic would dictate that the single-aileron roll rate is half that with two ailerons, but I haven't measured. 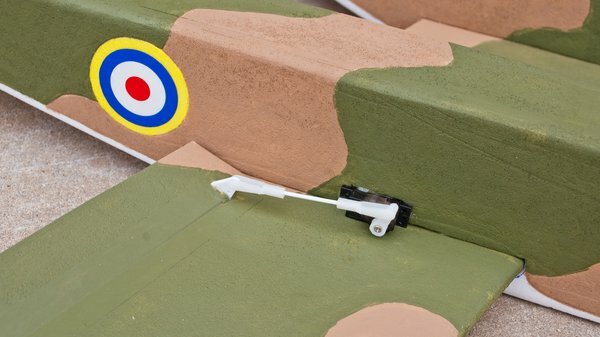 Interestingly, the rolls do not appear any less axial, nor do I detect any adverse yaw when using one aileron. 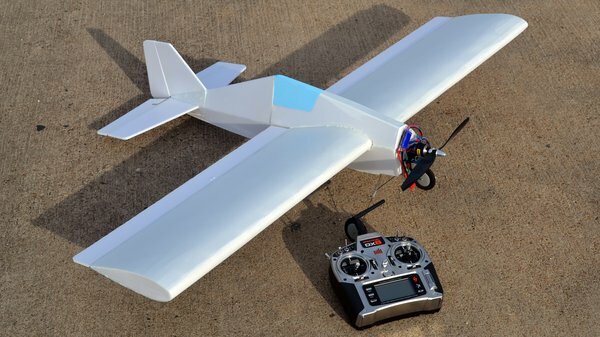 Flying with one aileron feels just like using two ailerons, but on low-rate throws. I truly expected to detect more differences. My single-aileron experiments with the Parallax and Hots revealed a pair of important data points. First of all, I found that sport airplanes don't require two ailerons to fly well. 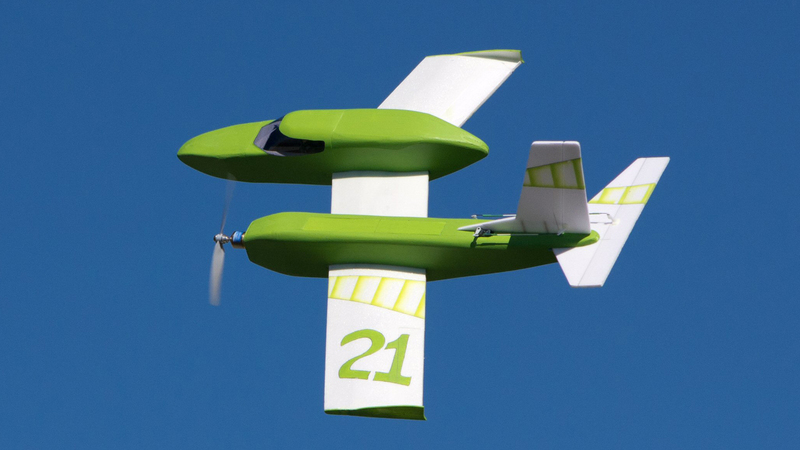 Both models fly with absolute control using only a single aileron. Secondly, I see that different models have different effects when using one aileron. Rolls with the Parallax became more barrel-shaped, while the Hots' rolls remain axial. With only one aileron active, the Hots still flies quite normally. Rolls are significantly slower, however. Just because you can get away with one aileron doesn't necessarily mean that you should. Consider it an option to keep in your back pocket for a rainy day. It may just prove to be advantageous for a future project. Using a mix like I did for the Hots, you can perform a similar experiment with just about any model that uses two aileron servos on different channels. It would be interesting for me to see if faster and more heavily-loaded models exhibit more significant differences with a tacit aileron. If you try this with one of your models, please share your results with me!